Note that in 2018 the Disabled Parking has had to be changed and is no longer as stated in the Fair Programme. It is now located at Lords Meadow Lane as shown on the map above. Please note you MUST enter Bampton via the South Molton Road - other routes are blocked by road closures sealing off the centre of the town. Stewards will advise you when you arrive. Nearly everything at the Fair is accessible by wheelchairs as access is via the streets of the town. 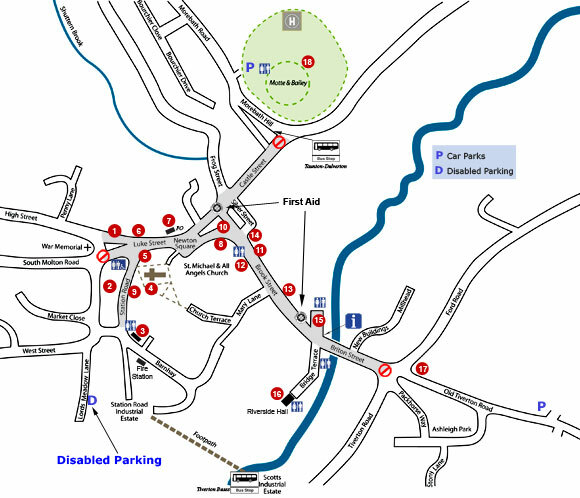 Disabled toilets are provided at the funfair near the Swan (5 on the map).